As Germany’s oldest organic coffee-roasting business, organic farming is a matter particularly dear to our hearts. This traditional form of growing crops promotes and utilises the stability of natural eco-systems and forgoes the use of any mineral nitrogen fertilisers or chemical/synthetic pesticides. Instead, birds and insects are protected as beneficial organisms so they are able to keep the pests in check in a completely natural way. The shade trees customarily found on ecological coffee plantations are therefore also not seen as an obstacle to efficient cultivation – a reason why in other places they are often cut down. 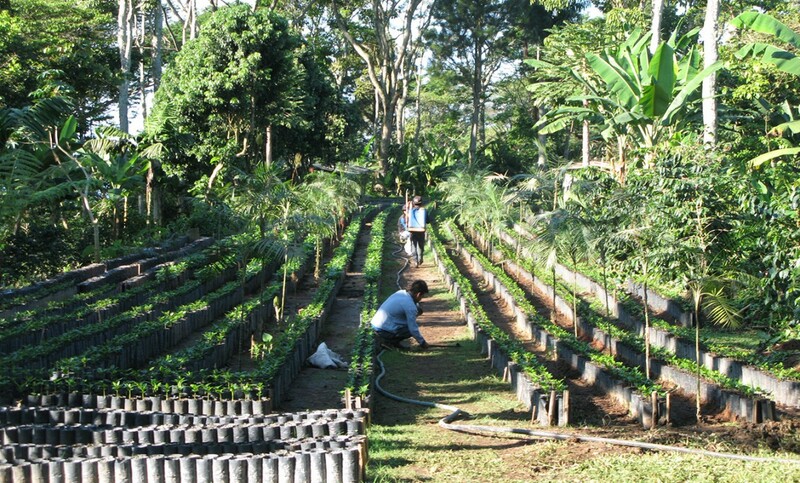 Quite the contrary: they offer beneficial organisms shelter, prevent soil erosion on often steeply sloping sites, while guaranteeing that the coffee plants grow well. Coffee is a tropical shrub and by its nature appreciates shady trees that protect the soil from drying out or becoming unduly hot. At the same time, however, the coffee plant still gets enough sunlight to ensure a good harvest. The yield of shade-grown coffee is somewhat less in the first few years. On the other hand, it remains at a consistently high level thereafter. In general, coffee plants under shade trees live longer.